This week we chat to Rachael, she has found that experience, passion and the ability to network are key to finding a career in marine conservation. I grew up over a six-hour drive away from the ocean and only saw it once or twice a year. Still, I always felt a strong connection to it. I was fascinated with the ocean – the vastness of the water made my problems seem so small; the mystery of what lie beneath the waves sparked my imagination. As I pursed a degree in Public Relations with minors in Biology and Psychology at Fredonia State University, I learned about the plastic-filled gyres and all of the damage humans are doing to this incredible resource. I knew then that I needed to help communicate this crisis to the world and inspire others to become part of the solution. My first step was to get some experience in the field as the Host and Associate Producer of the syndicated television show, Aqua Kids. During my two seasons with the show, I saw first-hand how human actions are negatively affecting the ocean. I also spoke with scientists from many different disciplines and learned about the incredible work they are doing to restore aquatic and marine environments. I was sure to leave every episode on a positive note with what viewers at home can do to help. After Aqua Kids, I went on to work at a small non-profit called CT Fund for the Environment and Save the Sound. Here, I worked in both the Communications and Development departments and learned how all of the different departments worked together to help achieve the overall mission. I was able to try different communication tactics and focus my career goals. 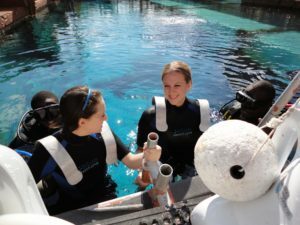 To build out my professional network and better understand the science behind the issues, I obtained my Master’s in Marine Conservation and Policy from Stony Brook University. During this time, I was able to hone my communication skills at the Alan Alda Center for Communicating Science. I also completed my Capstone project with the Surfrider Foundation and their Ocean Friendly Restaurants program. Upon graduating from Stony Brook, I struggled to find a job. This is a competitive field and there are simply not enough jobs to meet the rising demand. I took a break from the traditional way of applying for jobs online and started doing a broader search for ocean-focused organizations. That’s when I came across The Ocean Project (TOP) – the behind-the-scenes global coordinator for World Oceans Day. They had a small team of two full-time staff and I noticed a posting about internships. I reached out to the Executive Director, Bill Mott, who happened to live a few hours away and he agreed to meet me for coffee. We talked about my background in youth and ocean conservation and discussed Bill’s plans to expand TOP’s youth initiatives. This was a perfect fit for both of us, so I started working for TOP part-time until the funding became available to move my position to full-time. I have been working there now for almost a year! I truly enjoy all aspects of my job but would have to say working with the World Oceans Day Youth Advisory Council is a highlight. This is a group of 24 youth leaders from 20 different countries that come together to help shape World Oceans Day and develop projects that empower young people to become leaders in their local communities. I am always amazed at the work they are doing and motivated by their energy and innovative ideas! Absolutely! Working with our network of over 2,000 organizations from 150 countries and our rapidly growing global youth network of over 2,000 individuals, makes me confident that we are making a difference, together. Restoring and protecting our ocean can seem like a daunting task but when you join forces with others you can actually start seeing the impact of your work on a large-scale. Getting into this field is really about your experience, passion, and ability to network. While school is highly important, it simply isn’t enough. You need to demonstrate that you have the motivation to keep going, no matter the odds. You can become burned out focusing on problems day in and day out, so it’s important that you start out with the right attitude. Instead of shaming people for doing wrong behaviour, applaud them for doing the right thing. The more we celebrate good behaviour, the more people will want to join the party. Shocking imagery, like the turtle with the straw in its nose, can grab people’s attention but does little to change behaviour and at the end of the day that’s our main goal. Keep that end goal in mind throughout all of the work that you do. I wish that I had been more engaged in policy at a younger age and had the confidence to start my own local campaigns. Being civically engaged, even if you’re not old enough to vote, is crucial and in many cases is the most direct way to reach your goal. Don’t give up. If this is something that you truly love, then you will find a way to do it. Keep in mind that you must find your own path and that it’s ok to take a detour every now and then. Always be on the lookout for open doors and don’t be afraid to get outside your comfort zone. My favourite marine creature is the cuttlefish because I am amazed by their camouflage ability. Plus, they’re so dang cute! 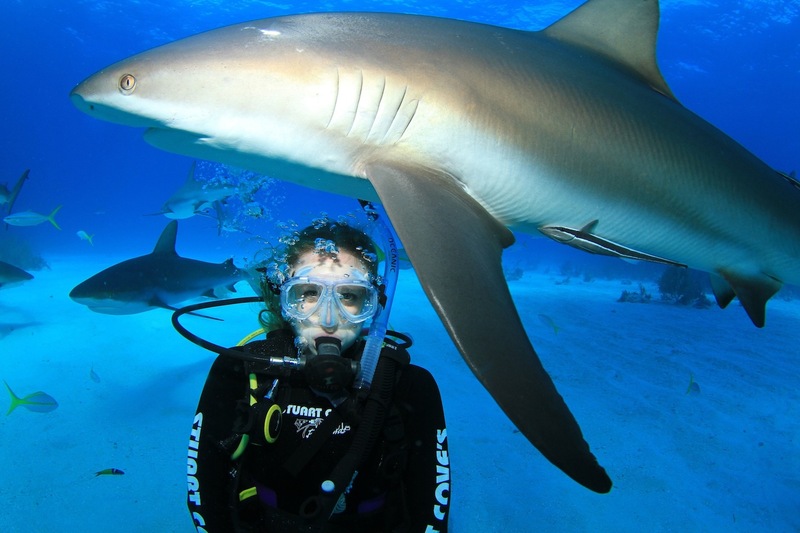 My most unforgettable moment was scuba diving with Caribbean reef sharks in the Bahamas while filming for Aqua Kids. This experience helped me undergo a transformation and I came up from it with a new-found love for sharks. As they swam around me – and even brushed up against my back – I felt my tension ease and was left in awe of these beautiful creatures. Thank you Rachael for your interview! To find out more about World Oceans Day click here!